...The World Bank annual reports are entitled "Intifada, Closures and Palestinian Economic Crisis." They make the very simple point that the intifada--an armed Palestinian war on Israel--leads to closures and thus the combination brings on a crisis. Why is there no peace? Israel doesn't give enough concessions. Often there is no mention of Palestinian hardline positions, behavior in not keeping commitment, terrorism as a key element in the failure to achieve peace. Most important of all, there is endless talk about what Israel can or should give for peace but far less about what the Palestinians must give: end of conflict, full recognition of Israel, return of refugees to a Palestinian state, a real end to incitement and terrorism. Why is there suffering in Gaza? Israel's restrictions. Far less mention of Hamas hard line, openly genocidal stance, constant aid to terrorist attacks and rocket firing, refusal to meet even minimal international requirements. Why are Palestinians, to quote the Reuters story, "Deprived of dignity"? No mention of a corrupt government and gangs of gunmen who couldn't care less about their well-being, and a strategy that starts unwinnable wars. It's all Israel's fault. 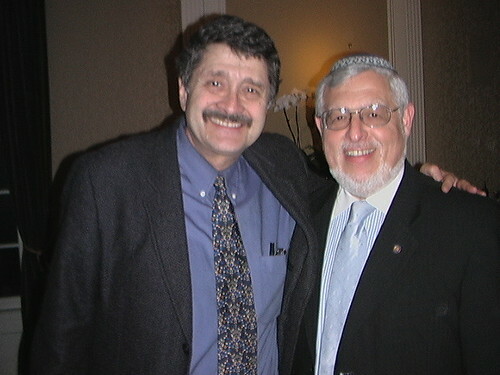 Orthodox Union West Conference Chair Rabbi Alan Kalinsky welcomes radio personality, Michael Medved. An orthodox Jew, Mr. Medved spoke to attendees about finding the balance between traditional religious Jewish-values and the contemporary values conveyed through mass-media into orthodox households. Video is in 6 segments (click Menu button on lower left of player). Those (and there are many) who don’t know the history of the Jewish people and who have fallen for the propaganda lies that Israel was only created as a result of the Holocaust or that Jewish immigration to Palestine started in the 1880s would do well to read this concise historical account by Dore Gold and Jeff Helmreich. The key point it makes is that Israel was not a new creation but the restoration of the Jews’ ancient national home, to which the international community recognised in the early years of the last century that they and they alone had an overwhelming legal and moral claim. This was specifically on account of the fact that they had never renounced the land -- which had only ever been the nation state of the Jews alone -- but had been driven out; and that throughout the period of their exile they had repeatedly returned and established majorities in different parts of the land including Jerusalem. It should also be borne in mind that the present state of Israel is merely a small fraction of the original Jewish nation state; most of it was given away by the British to the Arabs in 1921 as a piece of regional realpolitik, and the remainder was to be divided between Jews and Arabs – the original two state proposal which the Arabs rejected in order to drive the Jews out of their rightful and internationally recognised home, the project which continues to this day. The Jewish claim to the land of Israel was based on justice, international agreement and law. As a result, it is the only nation state whose legitimacy was agreed by the League of Nations and its successor, the UN. The reason I bang on about this so much is because the Big Lie of Israel’s alleged illegitimacy and presumption lies at the heart of the wider war against the western world. It incites hatred and murderous hysteria in the Arab and Muslim world, and has turned many otherwise decent western liberals – who now openly say Israel should no longer exist -- into the intellectual accomplices to a second projected genocide of the Jews as well as making more likely their own eventual defeat as a civilisation. As Dore Gold writes in his outstanding book, The Fight for Jerusalem, the jihadis see the Muslim conquest of Jerusalem as the essential prerequisite to their conquest of the world and the arrival of the end of days. Unless the west comes to understand this, and to understand the way in which this conflict has been so shockingly misrepresented for so long in the western mind and with what terrible consequences, it will itself be defeated. The fate of Israel is intimately tied to the fate of the free world. Attitudes towards it are the litmus test of civilisation. It is, quite simply, the biggest moral issue of our times. A new critique of Israel proposes its elimination and replacement with a bi-national Palestinian-Jewish state. Israel's new detractors doubt the legitimacy of Jewish statehood, though they say nothing about the validity of dozens of new states that have emerged in the last half century, many of which lack any firmly rooted national identity. The new attack on Israel's right to exist as a Jewish state is particularly ironic since Jewish nationhood preceded the emergence of most modern nation-states by thousands of years. The new critics of Jewish statehood neglect the fact that Israel's communal expression - like that of many communal states around the world - in no way infringes the rights of minority citizens, who enjoy full equality under the law and the political system. They also ignore that this form of national expression is not unique; indeed, most states identify in some formal way with the religious or cultural heritage of their predominant communities. Yet only Israel is singled out for criticism. Israel is the only state created in the last century whose legitimacy was recognized by both the League of Nations and the United Nations. The League of Nations Mandate did not create the rights of the Jewish people to a national home in Palestine, but rather recognized a pre-existing right - for the links of the Jewish people to their historic land were well-known and accepted by world leaders in the previous century. By 1864, a clear-cut Jewish majority emerged in Jerusalem - more than half a century before the arrival of the British Empire and the League of Nations Mandate. 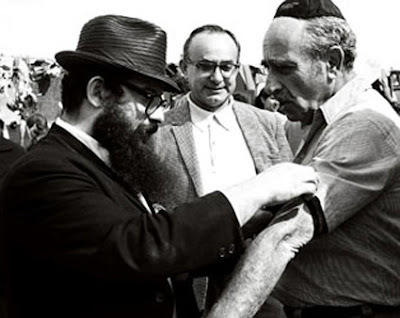 During the years that the Jewish presence in Eretz Israel was restored, a huge Arab population influx transpired as Arab immigrants sought to take advantage of higher wages and economic opportunities that resulted from Jewish settlement in the land. President Roosevelt concluded in 1939 that "Arab immigration into Palestine since 1921 has vastly exceeded the total Jewish immigration during the whole period." Israel's new detractors seek to delegitimize Jewish national rights by arguing that their assertion was an extension of European imperialism. In fact, Jewish underground movements waged an anti-colonial war in the 1940s against continuing British rule. Israel was an anti-imperialist force when it first emerged, while the Arab states were aligned with the imperial powers, their armies trained and supplied by the French and British Empires. There was no active movement to form a unique Palestinian state prior to 1967. In 1956, Ahmad Shuqairy, who would found the PLO eight years later, told the UN Security Council: "it is common knowledge that Palestine is nothing but southern Syria." In the early 1960s, many Palestinians looked to Egypt's Abdul Nasser as their leader as much as to any Palestinian. Given the historical background, it is impossible to argue that the Palestinians have a claim to the Land of Israel superior to that of the Jews, as Israel's detractors contend. The new assault on Israel is partly based on ignorance of Jewish history in today's highly secularized world. But it also emanates from a new anti-Semitic wave reflected in a public opinion poll by the European Commission showing Israel as the country most regarded by Europeans as a threat to world peace. The president of the European Commission, Roman Prodi - alluding to the anti-Semitic underpinnings that led to the poll's results - said, "to the extent that this may indicate a deeper, more general prejudice against the Jewish world, our repugnance is even more radical." U.S. National Intelligence on Iran: Duped, Duping, or Double-Dealing? Americans accepting the NIE Estimate is like the Jedi Council clouded by the Dark Side of the Force while the Dark Lord of the Sith was plotting under their noses. 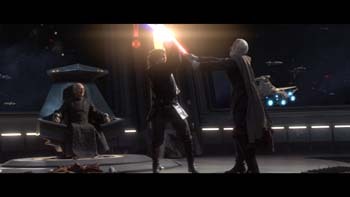 Count Dooku: What if I told you that the Republic was now under the control of a dark lord of the Sith? Obi-Wan: No, that's not possible. The Jedi would sense it. Count Dooku: The Dark Side has clouded their vision. Hundreds of senators are now under the influence of a Sith lord called Darth Sidious. Obi-Wan: I don't believe you. YID With LID: Iran Nuke Findings Based on Iran Officials Notes. So why has America done this? Maybe because it has sold Israel to the devil, in the shape of Iran and Saudi Arabia, in order to save its skin in Iraq. As we know, it is of overwhelming importance to President Bush that peace comes to Iraq by November’s presidential election. The situation in Iraq over the past few months has dramatically improved. This has been assumed to be because, under the shrewd strategic leadership of General Petraeus, the previously terror-supporting and fratricidal tribal leaders finally turned against al Qaeda and decided to unite to reclaim their country from the endless spiral of mass murder. But there may be another explanation. The Samson Blinded blog suggests the US did a deal with Iran, in which Iran wound down its support for terror in Iraq — in return for which the US promised not to bomb Iran. The NIE was published to cloak this decision in the convenient if implausible fiction of the scaling down by the US intelligence community of the Iranian threat. The major player at Annapolis was Saudi Arabia. It was Saudi’s ‘peace plan’ to destroy Israel which the US was trying to force Israel to accept. My own sources suggest that at the heart of Annapolis was another deal done with Saudi Arabia by the US. Saudi is absolutely terrified by the power of Iran, which it perceives as a major threat to itself and its role in the entire region. Saudi well understands that for Iran, the destruction of Israel is the core goal of goals which is driving Iran’s nuclear weapons programme — a programme that also directly threatens Saudi itself. So it made a deal with the US. Saudi would tell its terror puppets in Iraq to back off — and as a quid pro quo the US would force Israel to the negotiating table with the Palestinians and set in train a process to force it into concessions that would deal it a mortal blow. Thus two birds would be killed with one stone: Iran’s frenzied impulse to build a nuclear weapon — and Israel itself. If this analysis is correct, Israel’s existence and the safety of the world have thus been bargained away in exchange for the ability of a US president to declare success in Iraq. On the other hand, as I said in my post below, it may be that Bush has simply been out-manoeuvred by both the spooks and the State Department. The NIE report is of course being cheered on by all who see America (and Israel) rather than Iran as the major threat to the world. Those who believe the poisonous fiction about the ‘neocon conspiracy’ will once again be unable to grasp what is staring them in the face. Indeed, madness over Iraq is now broadening into madness over Iran. Those whose truncated brain processes tell them that the failure to discover weapons of mass destruction in Iraq proves that they never existed now claim that the Iranian threat is no more than a malevolently constructed fiction. Neocon ‘warmongers’, they say, believe US intelligence when it says there is a threat but not when it says there isn’t. This ignores the context of that intelligence. All intelligence should be regarded with a degree of circumspection. It has to be assessed in the light of everything else that we know about the given situation. Given what we knew back in the 1990s about Saddam -- his regional ambitions, ties to terror and WMD efforts -- it is reasonable to conclude that US intelligence first failed to assess correctly the threat he posed to the west; then got part of it right; and then devoted the aftermath of the invasion of Iraq to putting out disinformation in order to cover up their own past incompetence. And given what we know about Iran, the NIE’s volte-face simply isn’t credible. The report states as firmly as it can that Iran was developing a nuclear weapon until 2003. Is it really likely that it would have stopped and not re-started? If so, why is it continuing to defy the international community by enriching weapons grade uranium in 3,000 centrifuges? Why doesn’t it open up all its nuclear sites to IAEA inspectors? Why has it gone to such lengths to scatter and bury its nuclear installations? Why would a country whose president has said: ‘We must get ready to rule the world… the Islamic government in Iran is the pre-requisite for a world wide Islamic state’, which has committed itself publicly to the destruction of Israel and which is responsible for blowing up coalition soldiers in Iraq as part of its three decade-war against the west, want to restrict its nuclear technology to the blameless production of electricity? Those who bat such questions away would believe in fairies at the bottom of the garden. The west is signing its own death warrant. With its ignorance and stupidity exceeded only by its arrogance, it is unable to see that it is being played for suckers. Pull yourself together, Mr President. You may score temporarily in Iraq, but at what terrible cost? She updates: As the Weekly Standard points out for the umpteenth time, the US intelligence community has a lousy record in that part of the world. Ever since the war in Iraq, elements within that intelligence community have been throwing disinformation around both to santise retrospectively their own incompetence and to thwart President Bush’s foreign policy approach towards the ‘axis of evil’. This latest NIE smells like another exercise in political gamesmanship. No-one knows whether President Bush intends to strike Iran before he leaves office. What this NIE tells me is that some intelligence folk think (with ‘high confidence’) that he may well do so — and they are determined to stop him. They weren’t even independent intelligence officials at all. No wonder this NIE is such an insult to the intelligence. "The proper way to read this report is through the lens of the long struggle the professional intelligence community has been waging against the elected civilian administration in Washington. They have opposed President Bush on nearly every major policy decision. They were against the Iraqi National Congress. They were against elections in Iraq. They were against I. Lewis Libby. They are against a tough line on Iran. One could call all this revenge of the bureaucrats… The bureaucrats may even think they are stopping another war." It's a dangerous game that may boomerang, making a war with Iran more likely. Our diplomats, after all, hoped to seal this month a deal to pass a third Security Council resolution against Iran. Already on Monday the Chinese delegation at Turtle Bay has started making noises about dropping their tepid support for such a document. Call it the Van Diepen Demarche, since the Chinese camarilla can boast that even America's intelligence estimate concludes the mullahs shuttered their nuclear weapons program more than four years ago." As a result of the NIE, the world is now an even more dangerous place. What perfidy. Ahmadinejad has every reason to gloat. Unless the US pulls itself together, this is the way the west loses. The US intelligence report showing Iran froze weapons development in 2003 does not show the full picture, a top US intelligence official told Congress on Thursday. The deputy director of National Intelligence, Donald Kerr, told a House of Representatives Intelligence subcommittee that Iran retains key nuclear capabilities despite having frozen its weapons development and its ambitions could be considered benign, Reuters reported. Kerr said there was reason to believe Iran still wanted an ability to make nuclear weapons. He was responding to a Republican lawmaker who questioned the accuracy of an official National Intelligence Estimate this week that said US agencies did not know whether Iran intended to develop a nuclear weapon. "We did not in any way suggest that Iran was benign for the future," Kerr told the panel. "What we had to do was address the evidence we had, that at least a part of their program (was) suspended in 2003." Kerr noted the assessment also concluded with "moderate confidence" that Iran still wants a future weapons capability. US Rep. Todd Tiahrt, a Kansas Republican, told Kerr he was puzzled by the new intelligence estimate. "We have this sort of dichotomy, the words and actions from Iran seem to be offset by the National Intelligence Estimate," Tiahrt said. He suggested US intelligence agencies had gotten too big at their headquarters and not put enough agents in the field. Annapolis: A Naqba (catastrophe) of our very own? In 1938, the world was silent while 6, 000,000 Jews were systematically brutally murdered. More than 20,000,000 men, women, handicapped, aged, sick, prisoners of war, forced laborers, camp inmates, critics, homosexuals, Slavs, Serbs, Germans, Czechs, Italians, Poles, French, Ukrainians, and many others were murdered along with the Jews. Among them 1,000,000 were children under eighteen years of age. Let's work together to send a loud and clear message about what is happening TODAY in Annapolis. CCJ is sponsoring an innovative grassroots effort to generate calls to the White House, the State Department and the Israeli Embassy so that the calls are free. Simply click here or on the link below and you will be asked to provide name, state and phone number. You will be called and connected to the White House, State Department or Embassy as requested by you. There's even a suggested script for a short, effective message. The Thanksgiving holiday weekend is over but Annapolis is upon us - so let's do our part here to bombard and drum this message into their heads and hearts. For those who want to make their message even more powerful, make your own phone call to the following American congressional aides who have can have influence on the Annapolis catastrophe (naqba). Below you will find a short list of the aides to key influential members of Congress with contact information. Contacting aides is the way to go. A fax or phone call is most effective; e-mail only if nothing else is possible. At the bottom you will find a cut and paste email list of the email addresses. Copy and paste email and keep sending anti-Annapolis letters. This list includes the above email addresses as well as the email addresses to the Israeli Consulates throughout the US and to Shas and Lieberman parties in Israel. For those who live in Israel and for those who are Israeli citizens, here is the list of Knesset members. Remember that phone calls and faxes are much more effective than e-mails. Telephone blitz list of MKs to call, fax or e-mail about leaving the government now. “Shalom, MK ______ . I am _____, a concerned citizen (who supported the ______ party in the previous election. I am asking you, as the deadline of Annapolis approaches, to leave Olmert’s government before it will cause a calamity for the entire Jewish people. “Shalom, Chaver Knesset _______. Ani ___________, ezrach mudog, (shetomach b_________ b’bchirot ha’achronot) . Ani poneh eylacha b’kriah b’rega ha’acharon mamash. Ana, azove et memsholto shel Ehud Olmert lifnai shehamemshalah hazu tavee asone al am yisrael culo. Your brothers and sisters in Israel will be in mortal danger if the proposed giveaways are agreed upon at the Annapolis Summit. We must strongly object to any division of Jerusalem by the Government of Prime Minister Ehud Olmert & Co.
We must protest the planned expulsion of our 250,000 brethren living in Judea and Samaria – The Biblical Israel, and of inviting thousands of terrorists to live within 10 miles of Israel’s population centers. And, we must protest the imminent release of another 441 terrorists from Israeli prisons. Now you have the opportunity to Demonstrate Your Opposition to the Annapolis Summit . Bring placards (and the press)!